Yes, that is a legitimate statement, this will be the cutest spider, ever. And, for those that know me, you know the repulsion that spiders invoke in my core. I do a tap dance and basically scream/cry/try to sell my soul to the devil, anything to get away. I even barter with the spider. Like, if they disappear when I turn my back, we can pretend that we never crossed paths. It never works. The last spider I encountered even charged at me. That is enough of that story. When I stumbled across these beauties on Born Pretty, I was like 'yes, please', and they were the item I was most excited for. 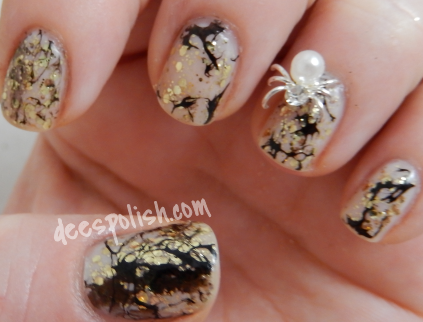 Now, I only pasted the spider to my nail for these photos. They, unfortunately, have this weird bump on the back, so they cannot adhere flush against your nail. I want to keep them for a fun special occasion mani.. so that is why it was only applied for this mani. BUT. This mani was specifically planned to showcase this little bad boy. Guh! This mani is just so pretty/girly.. and distressed.. and spider-y, all at the same time! So good. I did two coats of Don't Touch My Tutu! then did some 'sandwiching' with Rock at the Top (love this!! ), then, I did the whole distressed water marbling with Liquid Vinyl. I love the whole look of this. I even switched back to my holy grail base coat-top coat pairing of China Glaze Strong Adhesive Base Coat-Seche Vite Dry Fast Top Coat.. and I got 5 days worth of wear! It has been monnnnths with only a day or 2 while using the Glisten & Glow stuff. Apparently me and those 2 just do not mesh, which was upsetting as many people rave about it. Ahh well! That is all for today. If you go check out the Born Pretty store, and want to pick up some rad nail art goodies (honestly, who doesn't?! ), use the code AHB10 at checkout and save yourself 10%.